Highland Cream Thyme is such a bright little thyme that it makes a perfect foil for dark stepping stones. 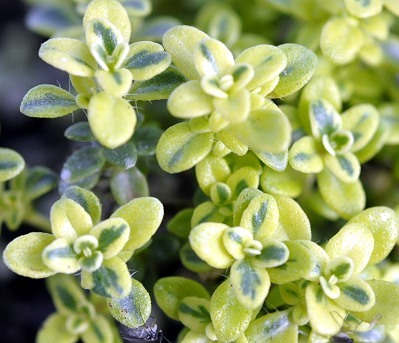 A smaller leaved, slower growing thyme makes this a good choice for tight spaces. It is often included in our popular Flagstone Filler Assortment. For a faster growing variegated thyme more suitable to a "lawn" situation check out Goldstream Thyme. This plant is often available in plug trays. These trays hold 128 of all the same plant. They are a great low cost way to fill a lot of space. Each cell is 3/4 of inch by an inch. Check here to see if Highland Cream Thyme Plug Trays are available.